Patricia Pavelka works and consults with schools and organizations for grades K-8 throughout the country to help increase the achievements of students. She develops and presents workshops on the following topics: Literacy, Guided Reading Management, Centers, Reading Strategies and more. Pat has authored 15 books. Thirteen of her books are professional education books, with the last three focusing on Common Core. She also has two children’s books with teacher activities included. Let’s look at how to keep track of what standard(s) we are working with this week, as well as keeping track of the standards we have already worked with in the past. We want to ensure that we are making connections between the different standards and looking at how they are related to each other. For example, looking at specific word choices the author uses (RL.1.6 & RI.1.6) can help students ask and answer questions about the comprehension of the text (RL.1.1& RI.1.1). 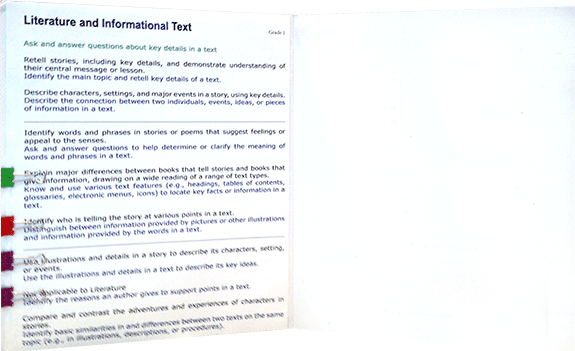 This example uses kindergarten Reading Literature and Reading Informational Text Standards. (this can be printed on paper sizes: 8.5x11, 11x17, 12x18, or other custom sizes). NEW! Download the Writing Standards. click here. Pat's three new Common Core books are now available. On the right sidebar, under "Videos and Activities," is a listing of activities in four categories. By clicking on a category title, you will go to a list of videos related to that specific topic. These ideas can be implemented the next day and can be tailored to your school's curriculum as well as state standards.